The teenage Kostas Iosifidis' light hands landed him a job at the egg store which he now owns and where he continues to sell every kind of egg. Thirteen long-term characters from the commercial center of Athens reveal their histories and their favorite routes. On the shelves and worktops, the heart of the old Athenian commercial center still beats. Some declare they’re “as old as the Acropolis”. Other younger members have stepped in to continue their family business name. They are separated by a few streets and united by a nostalgia for the old Athens – and the style in which they greet you – authentic, loud and heartfelt. Each of them preserves the scents and flavors of their beloved neighborhood on the shelves of their stores, warehouses and stalls. From Agia Irini to Varvakeio and Psirri to Ermou, the city is full of living legends. 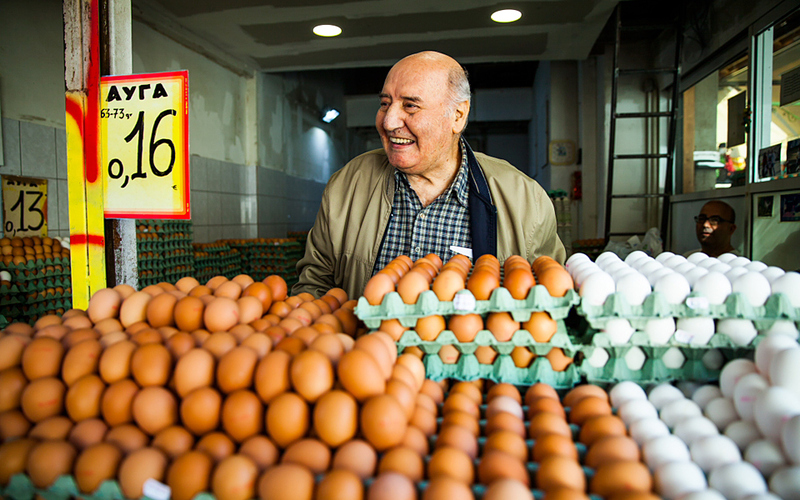 Whichever the category, all eggs are guaranteed to be “fresh, alive.” “How do I know they’re fresh,” I ask him. “You must listen to the egg,” he whispers. He picks one up from a stack in front of us, puts it to his ear and shakes it, like a busted wind-up watch. “When the egg is fresh, it won’t talk to you. When it’s been sitting there for a while, the yolk gathers in the center and you can feel it move.” Kostas lives in Nea Makri, a suburb in eastern Attica, but his heart beats in the alleyways, the ouzo bars and the old shops of Psyrri. 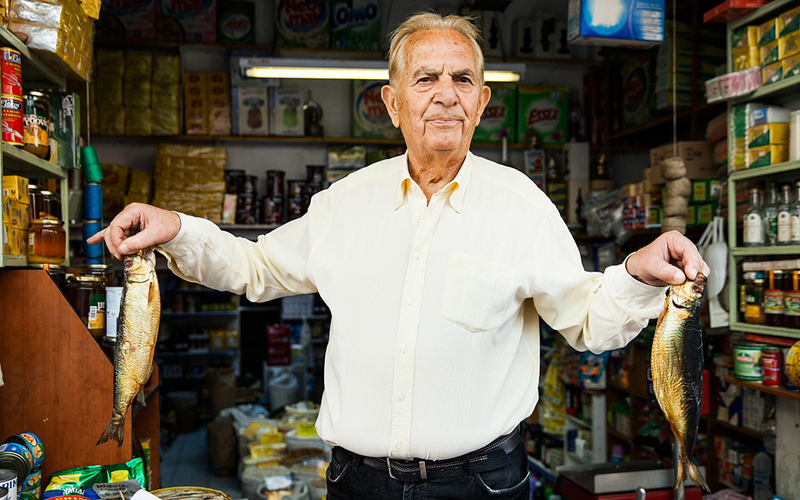 If you're over 80, the smoked fish at Ilias Koniaris' store is on the house. “Excuse me, sir? How much for this fish?” “If you’re older than 80, it’s free, sir,” answers Ilias Koniaris, wrapping a smoked halibut, insisting that the elderly gentleman take it, without paying. “I have a special rapport with my customers,” he says. Since 1975, Athenians have been climbing down the steep stairs of his small underground corner store, located at 4 Sokratous Street, to buy everything and anything, from shampoo and cleaning products, to salted fish and beans. “All of today’s supermarket moguls started out from this street here. I know each one of them by their first names. They left, we stayed.” He remembers the fruit stalls in the market when they were still peddling their produce from sheds. “The neighborhood was never bourgeois, but it had class, respect and honor. But then, the area went downhill. It happened in the 1990s, when the stores changed hands and the old owners, who loved the city center, left. The next 20 years were difficult for store owners. We saw everything here. From gangs to drug dealing. In the last five years things have started to pick up. We feel safer, and things are getting better,” he says. Ilias lives in an apartment in Psyrri and likes strolling on Dionyssiou Areopagitou under the Acropolis or sitting in a taverna in Pasalimani, Piraeus. 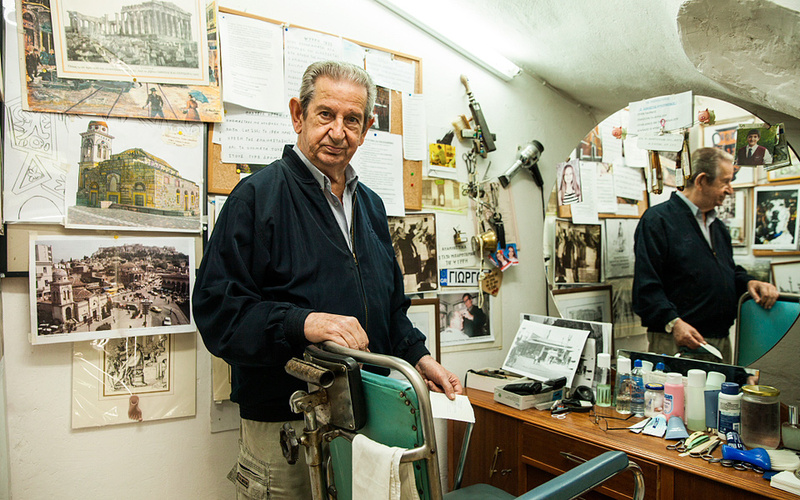 The old-school barbershop of 82-year old Giorgos Galitis, which these days he opens for friends and tourists. “I’ve worked hard my whole life. For 30 years, I worked two jobs, barber and house painter. The secret is to never get discouraged,” he says. “Elderly people come here, we reminisce about old times and laugh. Tourists come to my shop to photograph the straight razors, the chairs and the barber’s accessories. Of the 31 barbers that once operated in Psyrri, only four of us are still alive. That’s me and three others, who have stored their gear with me,” says Giorgos, showing off the old blades that hang from the mirror. 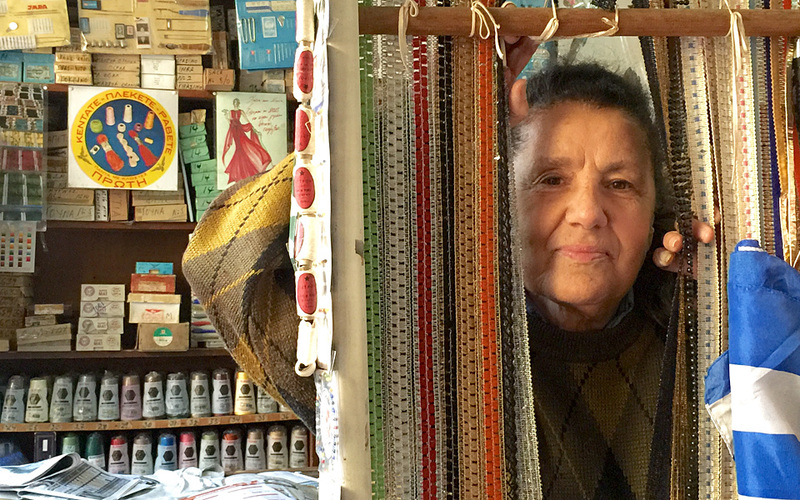 Maria Angelopoulou is a seventh generation Athenian who took over her father's haberdashery store. Maria grew up among strings, buttons and ribbons in the tailorware wholesalers her father opened after completing his military service in 1925. The store is still located in the same spot, on Agias Irinis Square. “We’ve been Athenian for seven generations. I saw the columns right after I was born,” she says, referring to the Parthenon, under the shadow of which she grew up, in Omonia Square. 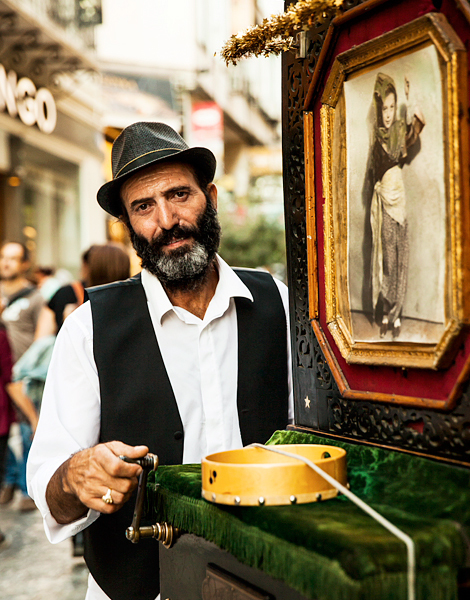 Organ grinder Giorgos Kizilis can be seen operating his 19th century organ on Ermou Street every day. Miran Kourounlian is today at the helm of the shop of his grandfather's who arrived as a refugee from Asia Minor in 1922. “It’s an 1884 Turconi,” says Giorgos Kizilis, stroking the wood of the street organ. If I were an expert, I would be impressed by the mention of this particular brand, considered to be the Ferrari of street organs. But Giorgos, who every day paces up and down Ermou Street, is no expert himself either. It is as if he owned a supercar, which he drives not because he wants to, but because he must. At nightfall, he “parks” his organ in a city center underground garage and takes the metro home, exhausted from his 15-hour working day. “I’m no pro. I became an organ grinder out of necessity,” he says, turning the hand crank of the barrel piano, filling the air with music from the spinning metal tube. This street organ is one the very few left in Greece. At the beginning of the 20th century, thousands plowed the streets of Athens. The barrel organ was a means of entertainment. “Its repertoire consists of songs from Istanbul. Old Athenians recognize them. I planned to put in some modern songs, but the maker in Thessaloniki asked me for €1,200 for the work. I told him I’d be back when I had won the lottery,” says Giorgos. He used to work as an electrician on a merchant ship, but after being laid off, he put the old street organ, which had been gathering dust in a corner of his house, back into service. 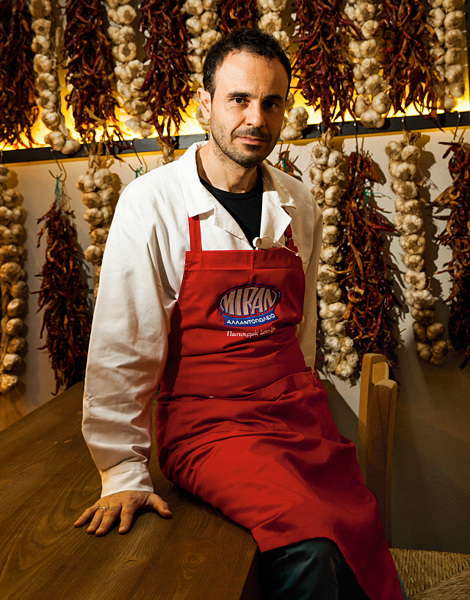 In the 1990s, Miran Kourounlian inherited this historic pastourma shop, founded by his grandfather upon his arrival from Asia Minor in 1922, at 45 Evripidou Street. For almost a century now, the store has been known for the fragrant, pungent smells of peppered pastrami, garlic and curry. “Please come in! Try the pastrami!” shouts an employee standing in the doorway. “Pastrami is dried meat, cured in paprika paste. You could call it eastern prosciutto,” Miran explains. Miran’s favorite habit consists of walking all the way up Voulis Street and visiting the antique shops, searching for hours on end for rare trinkets. Every first-time visitor to Athens, he maintains, should make it to Savvas’ on Mitropoleos Street and give the pastrami pie a shot. When she first opened her store, Aliki Katsikari used to make everything by hand; today her daughter has taken over the task. Originally located on the ground floor of a neoclassical building, the shop has now expanded next door, while all the pastries are baked on the first floor. “Everything here is handmade. Our recipes are based on my grandmother’s knowhow,” says Aliki, while the waiter serves a very generous scoop of kaymak ice cream with Turkish kanafeh on a plate. Her mother-in-law (the aforementioned grandmother) was originally from Smyrna (present-day Izmir in Turkey). She came to Athens after the Greek–Turkish war in 1922 and settled in Ymittos. “Like most women from Smyrna, she was a gifted cook,” says Aliki. 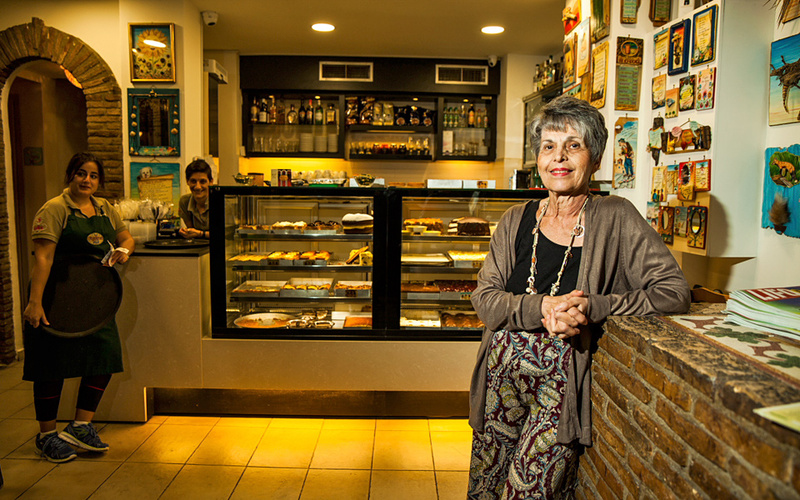 She passed on the recipes to her son and daughter-in-law, who opened Serbetika, but also to her granddaughter Maria, who has taken over all confectionary duties. Over 30 kinds of olives are on sale at Giorgos Valkanas' stall, including the perfect variety for a dry martini. 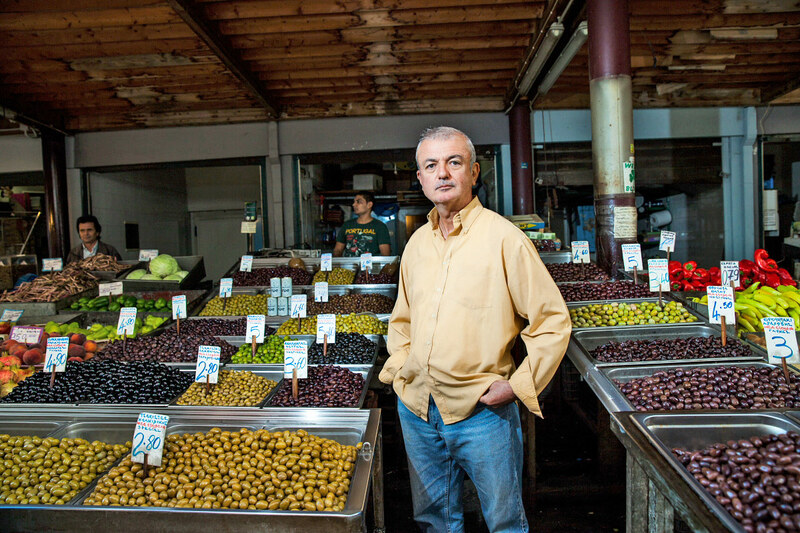 Giorgos Valkanas is a doyen of the Varvakios, Athens’ central market. He grew up in Plaka and for 30-odd years, his alarm clock has rung a little after five in the morning. Before sunrise, Giorgos organizes his stalls on Armodiou Street. Large, deep pans are filled with over 30 kinds of olives from every corner of Greece, including cut olives; throuba; pitless olives; olives stuffed with green peppers, capers, garlic or almonds; sliced; with salt or without. “Tourists usually ask for dry martini olives,” he says, dipping his ladle in a pan marked “Halkidiki Super Mammoth,” filled to the brim with firm, green olives. They are so big that a whole one could not fit in a person’s mouth. 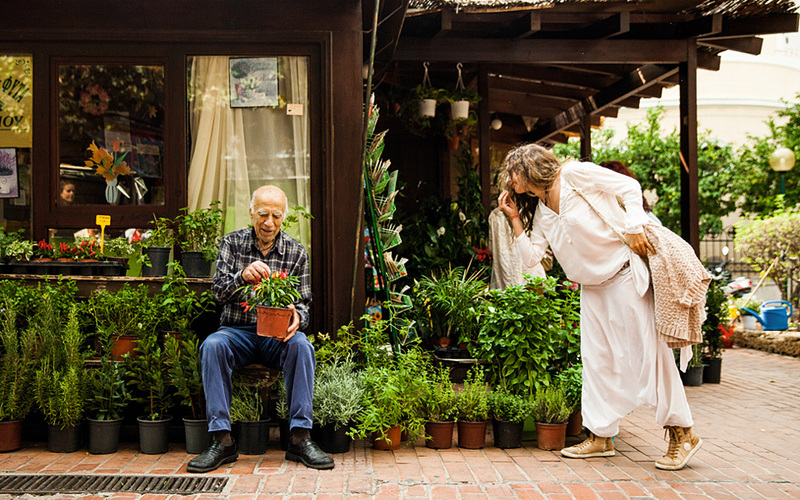 Through his long stint at his flower shop, Pavlos Vasiliou has catered to tourists, celebrities and politicians. Pavlos Vasiliou is the last of the 50 florists that once thrived in Agia Irini Square. He witnessed the transformation of the square from a flower and textile center to a hipster-magnet, thanks to its cafes and bars. 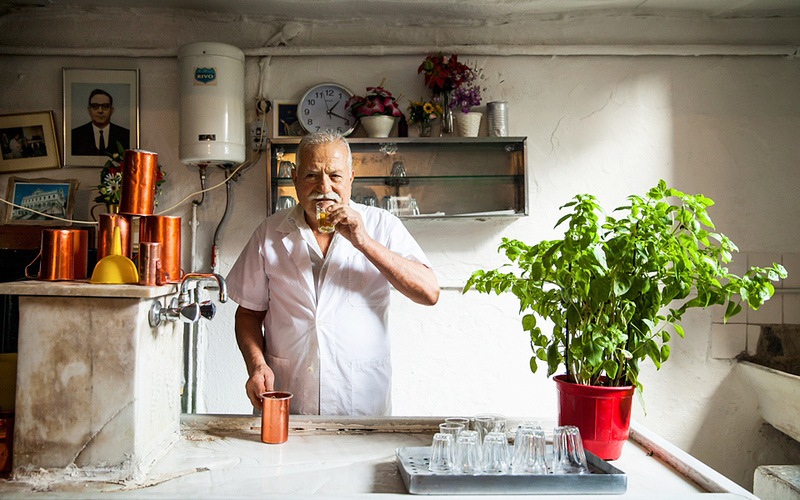 Although 82 years old, Pavlos opens his fragrant store, named Pavlos’ Fiore, every morning. The small wooden pavilion was originally just an aluminum shed, but eight years ago Athens municipality decided to fund its rebuilding. It is his “haven.” If you sit next to the heater in one of the square’s cafes that opened in the past five years, in buildings that once housed textile stores, you’ll see Pavlos arranging his flowers, watering his cyclamens, smelling his gardenias and lifting heavy flower pots with shrubs, like a 20 year old. I spotted him immersed in deep discussion with foreign tourists, even though his English vocabulary does not exceed a dozen words. “We also sell vacuum-sealed flower and herb seeds, specially for tourists.” For decades on end, he has enjoyed the patronage of prime ministers, diplomats, mayors and ship owners, who used to send their employees from far away, or come in person, to buy freshly cut flowers. “Well-known personalities have frequented my store,” says Pavlos, rattling out the names of many of his famous customers. “Prime ministers used to stroll in the square. They greeted me and I gave them gardenias,” he remembers. Blink and you'd miss Dimitris Kololios' taverna which has been running since 1875. Dimitris Kololios is the owner and a hardworking employee of the underground eatery located on the corner of Theatrou and Sokratous streets, right next to the Varvakios, Athens’ central market. To enter the premises, you have to duck in order not to hit your head on the low lentil. Well-informed Athenians know how to find the place, which has no sign above the door. Hot steam coming out of cooking pots welcomes the customer to Diporto, or “Two Doors,” a name derived from the fact that it has two entrances. “My grandfather started the business, my father kept it going and now it’s my turn. Nothing has changed in this restaurant since 1875,” says Kyr Mitsos, as Dimitris is nicknamed by his customers. Although he cooks from early morning to late afternoon, his white apron remains spotless. When he first climbed down the establishment’s stairs, he was just 13 years old and the eatery belonged to his father. Customers sat on the very same chairs, drinking resinated wine from the same barrels, eating the same traditional Greek recipes: fava beans, meat soup or cut pasta with beef, boiled vegetables and soup, just like his mother used to make. When a customer sits at a table, Kyr Mitsos approaches to spread a versatile sheet of paper, in lieu of a tablecloth. He is known for his multitasking skills: he stirs the pots, flips the fresh fish on the grill, arranges the orders, serves the dishes and fills the metal pitchers with wine. Another talent of his is mixing up the customers. If you're a cobbler, or just a curious passerby, Kostas Panagopoulos' store has everything for making shoes under one roof. 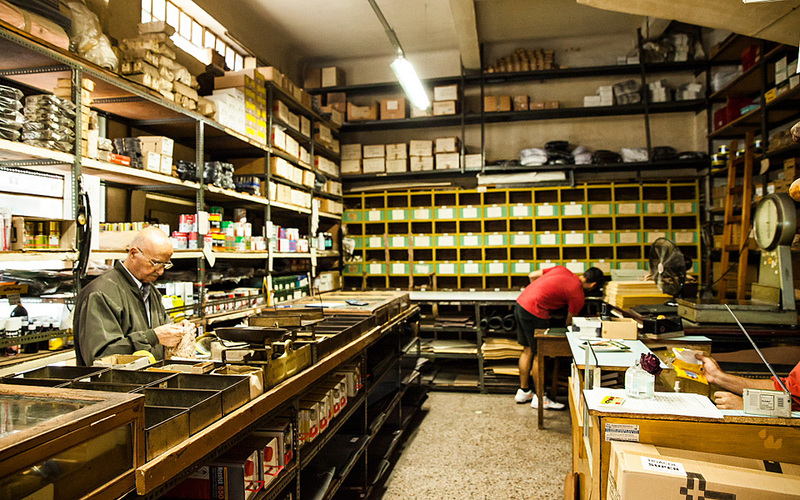 At 82, Kostas Panagopoulos owns the last shoemaker supplies store in Psyrri. Located in a 1930s building on Karaiskaki Street that smells of leather, he still sells everything pertaining to shoes and their upkeep. Although he stocks every item needed to make a shoe, he doesn’t fix them. “I’m a wholesaler, not a cobbler.” Cobblers are his customers. Today, Kostas sells to small manufacturers and makers. 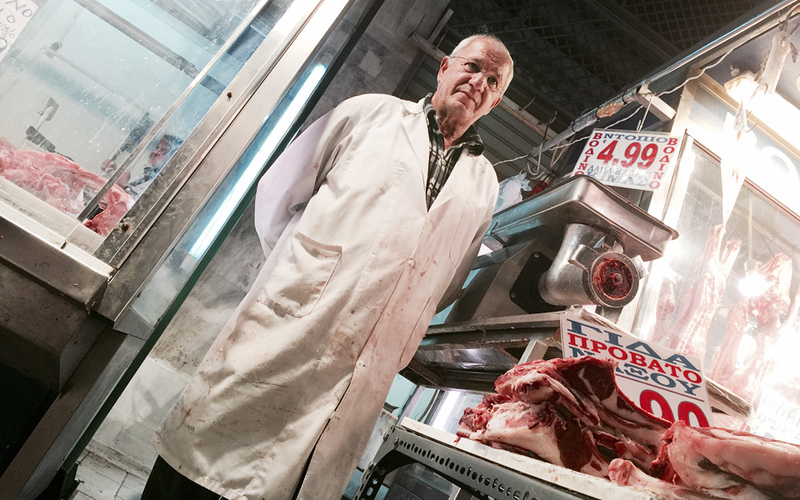 Christos Drenios' started learning the butcher's trade at the tender age of 13. “For tourists, the Varvakios is a gory sight. They take pictures of lambs’ heads and guts, a rare sight in the world. Only Greeks and Turks eat them.” The numerous fish pictures, hanging on the walls of his shop behind the till, would be more suited to a fishmonger’s than a butcher’s. They betray his fanatical passion for fishing, a hobby that pulls him every weekend to the seashore in Anavyssos, southeast of Athens. 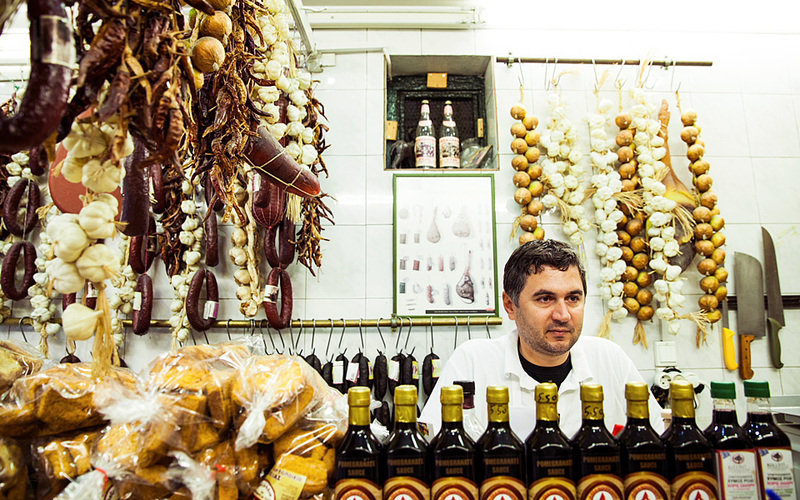 Fanis Theodoropoulos now heads the third generation of owners that have run the family sausage shop.